Not far from the Bukit Timah Nature Reserve, in the so-called Beauty World area we invite you to discover AsiaBox Living and its broad selection of Asian themed furnishings for every room in your home. With an emphasis on handcrafted pieces gathered from all over Asia, AsiaBox Living displays some alluring Asian antique and lovely reproduction furniture. 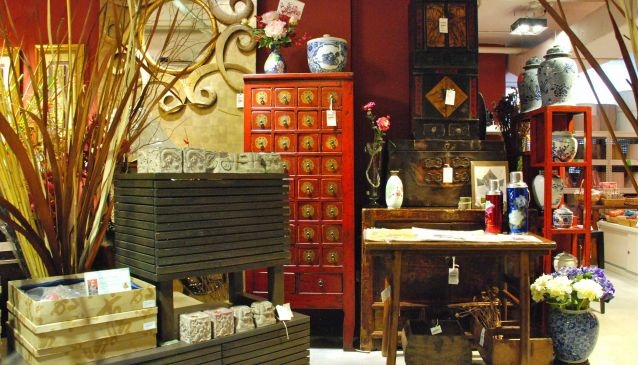 The store is full of large and small pieces, which show character and distinctiveness, such as Chinese kitchen cabinets, medicine cabinets and wedding cabinets but also Tibetan leather chests, drawers, sofa, tables and chairs. In addition to the Asian furniture and for a more contemporary touch, AsiaBox Living carries products from the brands Prakaria and Box Furnishing. At AsiaBox Living you'll find some decorative items and accessories at a very attractive price, that make great gifts for your friends or treats for you. Adorn your interior with some watercolour, oil or embroidery paintings from China or add colour and vibrancy to your table with some unique glasses, plates, bowls or placemats. Other decorative items include calligraphy paint brushes, miniature Chinese cloisonné enamels or beautiful vases from the fine collection of blue and white Chinese porcelain. Besides, ladies will love AsiaBox Living even more as it presents a great variety of inexpensive hand-crafted and folk-inspired fashion clothes and accessories: silk shawls, jewelries from Thailand and handbags are just some of the eye-catching items that will subtly complement any outfit. Mixing traditional and contemporary designs, AsiaBox Living is the place where you'll find lovely handcrafted accessories, decorative items from Asia and an attractive display of styled furniture that are both functional and elegant, the right decor to enhance your lifestyle and your home.